For some reason, I haven’t been able to find any jicama locally. It isn’t a common sight in Spain so it has been a really long time since I have been able to enjoy it. This past weekend, I saw some at the supermarket in Lafayette and just had to buy one. I didn’t really know what to do with it but yesterday I was so hungry and wanted something filling but light and it had to be raw. I also remembered all the dandelion flowers I have been pickling this spring and wanted to use some of those. I just sort of threw this together but it would be a wonderful substitute for guacamole for any kind of Mexican meal. Lower in fat, higher in fiber, and certainly cheaper! A win-win situation! Finely dice or shred jicama and place into a bowl. 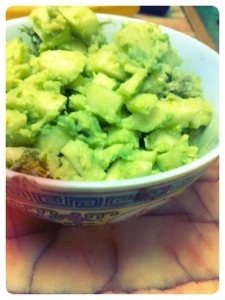 Then add all other ingredients and mix thoroughly until avocado is mashed into everything. Serve immediately.